What’s happened in this crisis is not that the State has imploded. It has, rather, split in two. We have parallel states, each with its own language and values. The first state is Namaland, a crazy kingdom whose subjects have infinite resources. The numbers that apply in Namaland are so vast that they seem literally beyond comprehension. Let’s instead consider just one concrete example of how this place works. Let’s start in Dumbarton, a small town on the Clyde river in the west of Scotland. It’s a place that most of us know, if at all, from the soporific hum of dreary names at the end of the football results: Stenhousemuir, Brechin, Forfar, Dumbarton. It has a blocky, concrete 1960s shopping centre, whose anchor tenants, you’ll be interested to know, include Peacock’s, New Look and Bonmarche. Why am I telling you this? Because the shopping centre in Dumbarton has recently cost us - you, me, our kids - almost 15 million euro. Here’s how it worked. A British development company, Vico, refurbished and extended the shopping centre and sold it on to a private investor for 4.5 million euro. The private investor then sold it on to a firm from Northern Ireland, Jermon, for a staggering 20 million euro. Jermon went bust and last month, a London-based investment management group, La Salle, bought the Dumbarton centre for 5.5 million euro. Note that at no point in all of this was the complex ever owned by anyone in the Republic of Ireland. Ownership switched from Scotland to Northern Ireland to England. But Jermon borrowed the money to buy the Dumbarton centre from Anglo Irish Bank, Allied Irish Banks and Bank of Ireland. Almost certainly, however, the ultimate source of this cash was a German, French or British bank. The Irish banks, in their manic phase, were the medium through which Continental pushers fed the habit of a UK developer. Nama, however, took these loans off the books of the banks and then flogged the centre off for 5.5 million euro - a loss of 14.5 million euro. One way or the other - either through what Nama paid directly for the loans or through the capital we put into the banks to fill the holes in their balance sheets - ordinary taxpayers have effectively stumped up nearly 15 million euro just to get rid of 120,000sq ft of shops in a small Scottish town. So we have one state that is effectively paying a London investment firm millions of euro to take a Scottish shopping centre off our hands. The money literally means nothing - it is simply gone. And then we have the other state, still called Ireland, in which 15 million euro is actually a hell of a lot of money. Again, let’s take a concrete example. In the other Ireland, something truly hideous is happening. One of the country’s major hospitals, Tallaght, is on the verge of being forced to close its doors to accident and emergency patients. 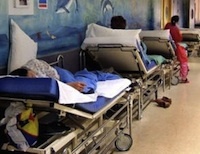 Last week, the Health Information and Quality Authority gave Tallaght a deadline of Thursday to stop putting emergency unit patients on trolleys in corridors. The hospital has been described by the Dublin county coroner as “a very dangerous place for anybody, let alone a sick patient”. A basic social service for half a million citizens is on the point of collapse. Many factors contribute to this, but one of them is a dire shortage of money: more people are looking for treatment than the hospital can afford to treat. Tallaght’s budget has been cut repeatedly under the so-called austerity programme. So how large is Tallaght’s deficit? 9.4 million euro - 5 million less than we’ve just spent getting rid of a shopping centre in Dumbarton. When you live in these two parallel realities, as a citizen of a split state, language loses its meaning. A word like “austerity”, for example, is just dead verbiage. In one of our states, we can waste 15 million euro without anyone really noticing. In the other, we have no money to ensure the basics of society - schools, hospitals, child protection - can function properly. Whole concepts mean one thing in one state and something else in the other. I recently read an interesting interview in The Irish Times with Mike Maloney, chief executive of Payzone. He explained that a “major financial restructuring” of the company in 2010 involved “its lenders, led by Royal Bank of Scotland, taking a 230 million euro haircut on their debts”. One of the major investors got wiped out: “At the end of the day they took their pain, they lost a lot of money. They placed their bet... they win some and they lose some.” Bad investment? Tough. In one of our states, this is common sense. In another, it is dangerous nonsense. Caught between the two, citizens struggle to know which world they inhabit.